After three in a row, I am taking a little break from Kindred Spirits. But no worries, another will post at 3pm today! I love how much more the two rooms flow together. I want this to be more of one great room for entertaining, rather than separate rooms. Mission accomplished, I'd say. and my favorite shot: the living room bay windows! To add a teensy bit more detail to the sneak peak I last showed you here (along with my neutral-palette inspiration for this space), here is an expanded snippet of what the room will feature. 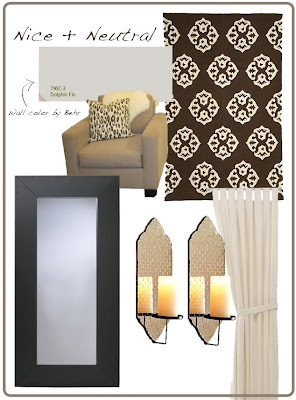 Included is my newest obsession - the mirrored wall sconces from West Elm - Christmas gifts from two of my dearest. Thank you, thank you! I know the room is looking a tad West Elm/IKEA weighted... but that's because I'm dealing with online photos. I can't wait to show you the revamped chairs and table for the dining room - both CraigsList purchases. All in good time, my pretties... all in good time. it looks fantastic - I am loving the soft grey as well! So excited to see the work in progress- loving the wall color. It looks so nice against the white trim! That looks Amazing! I can't wait to see it when you move in. How exciting! The new gray is my favorite and it looks sooo good! Beautimous, my friend! I am so into the gray walls lately. They look amazing with the wood floors. I can't wait until summer vacation when I have time to freshen up the walls in my house with new paint. *writes down Dolphin Fin to remember* Can't wait to see more pics as you move in and get settled. Congrats! It looks amazing! I love the color you selected. I can't wait to see it how it all comes together. Good thing you changed the olive-painted wall to Behr's Dolphin Fin shade. I can't wait to see how it'll look like after you have purchased the chairs and table. I agree with Danielle. The gray walls look really amazing with the wood floors. Did you just clean the floor or you also treated it?